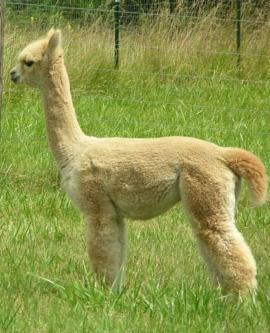 Peruvian - When we sold Peruvian Ion in 2005 (High selling male at our annual Las Vegas auction) it was only because we had a male we knew could take our breeding program to the next level, his name is Brilliance! 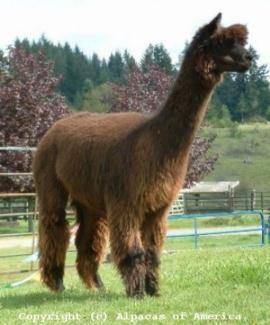 Hailing from an Accoyo dam (PPeruvian Gilda R0675) and a famous sire (Peruvian Ion S221 ALOA), we were ecstatic when we received his fiber stats. It read as follows: AFD 15.8, SD 4.0, CV 25.2, %>30 1.2. His perfect body conformation, solid bone, and wool blind face are just the tip of the iceberg with this superior male. 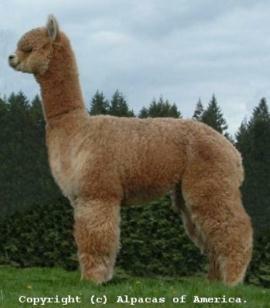 The uniformity of fleece throughout his blanket and tight bundles of high amplitude crimp made him one of the top breeding males on our farm. Add those factors in with his buttery soft hand and you should start to see the picture. Being a large farm we have the ability to be extremely picky about the males we add to our breeding program and when Brilliance was born we knew we had something truly unique. It is not very often a male of this caliber comes along. Sunshine herself is even better than her sister, Rainie who was sired by Ion. 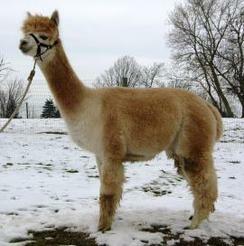 Sunshine has beautiful, dense, fine bright fleece, and a super gentle disposition. She has given us two exceptional crias. 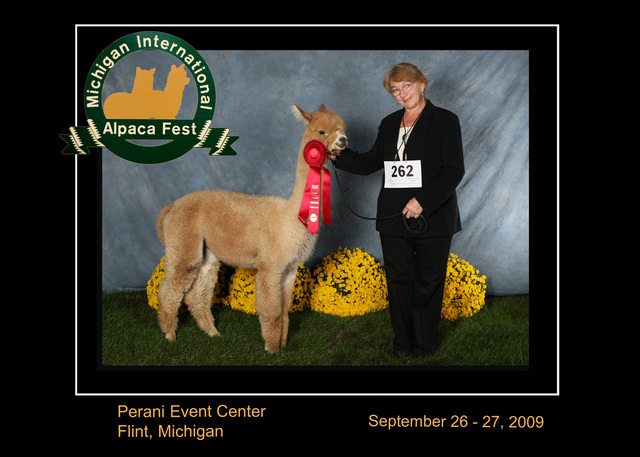 Her first cria was a male named Dream Weaver who began his show career at the 2009 Michigan International Alpaca Fest (MIAF) and earned a 2nd place. 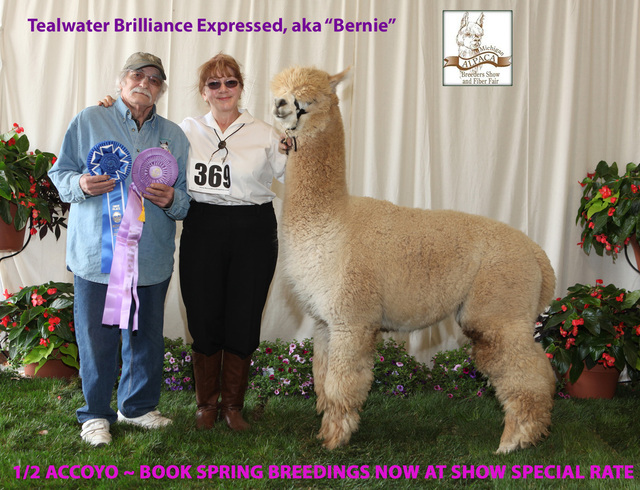 To take our breeding program even higher, Sunshine was bred to CPeruvian Accoyo Express. Her second cria, Tealwater's Brilliance Expressed, stood near the front of the class in his first shows up against elite competition, and earned a Reserve Champion. Affectionately known as "Bernie" he is a strong potential herd sire - take a look at Tealwater's Jupiter to see what he can produce.